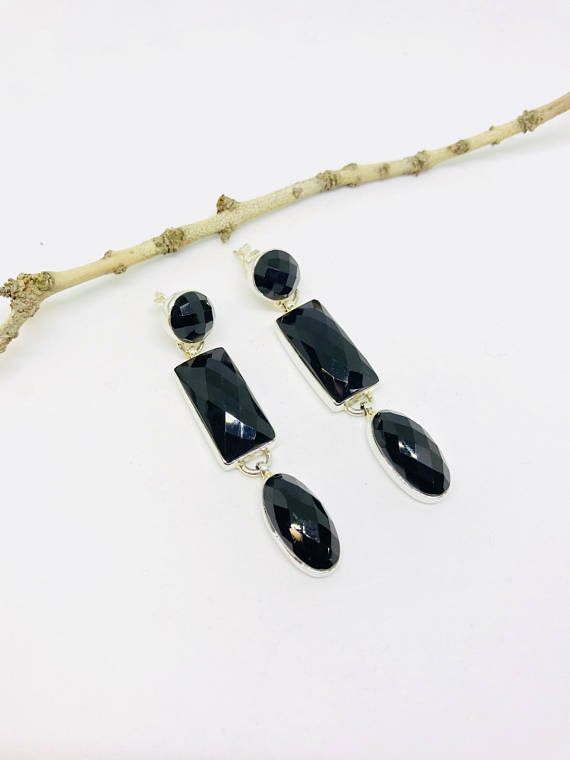 Faceted Black spinel gemstone earrings. Black Spinel &quot;the source&quot; crystal. Think of it this way--if a Black Tourmaline is able to heal on three levels, then a Black Spinel heals on twenty-four levels. I highly recommend this crystal for all healers. Black Spinel goes to the source of your illness, be it physical, emotional, or mental in its beginnings. This crystal will go in and find that source and work with you to clear it. It works many different levels, and its healing abilities are endless. A Black Spinel kills cancer cells, and it digs out poisons and toxins at the deepest levels. It is so powerful, I have even felt it attempt to move metal deposits in the body. Black Spinel is energetically one of the top three protective crystals I&#39;ve ever worked with, comparing to Blue Amber and Gel Sugilite. This crystal loves to work the 1st, 2nd, and 3rd chakras right off the bat. It will clear up any leg issues (i.e., fungus, poor circulation). It will clear and heal the female organs (i.e., endometriosis, cysts, infection). It clears the bladder, prostate, and kills infection and cancer in the intestines. I could write a book on this crystal, but suffice to say when you need to get to the source of your disease, then it is time to pull out a Black Spinel. Black Spinel works well with any other crystals. It is a very complimentary working relationship with all crystals and minerals. I respect this one, yet it will never ever overwork you or cause things to go too fast in your healing process. It is wise and gentle yet powerful. WOW! Black Spinel even balances the pH in the body. I also see it working on lymph nodes and white blood cells. This crystal works to kill infection in the lymphatic system and aid the body&#39;s natural defenses against infection. Black Spinel is also a wonderful piece for those with issues of rage who wish to clear it in a gentle healthy way. Black Spinel will absorb a great deal of that rage from you in the clearing process.